Considered the pinnacle of Japanese culture for more than a thousand years, the Japanese sword endures today as a legacy of the Samurai and as a beautiful but deadly work of art. Art of the Japanese Sword is a documentary featuring many of Japan’s top craftsmen who work together to create a priceless Katana or Japanese sword. You will enter a rarified world where ancient steel is forged into the sharpest and most feared cutting weapon. It is a story told in the swordsmiths own words that will reveal the mystery behind the Japanese sword and separate the myth from the fiction. The Japanese sword … prized as much for its exceptional beauty as for it’s deadly cutting ability. It has endured for a thousand years as the pinnacle of Japanese culture. Now you can enter a world rarely seen by outsiders. To experience the true story of the Art of the Samurai Sword. A story told in the swordsmiths own words that separate the myth from the fact. It is a fascinating journey that starts with swordsmith Manabe who makes his own steel from an ancient recipe dating back to the 13th century. In this unusually detailed look into the making of the Japanese sword, this documentary “lifts the lid” to reveal dramatic footage with techniques that until now have been the craftsmens best kept secrets. Going beyond films before it Art of the Japanese Sword showcases the polishers, scabbard and metal fitting makers as well the handle wrapping … the most comprehensive movie ever made on the Japanese sword. Follow the swordsmiths dream of creating a masterpiece, from the quest to making an ancient steel to forging a blade equal to those of the Kamakura, a medieval period that produced the greatest swords in history. For the martial artist the Japanese sword is a precise cutting weapon and symbol of the Samurai. For the collector, it is an art form whose beauty is derived from its deadly function to cut. As our story of the Japanese sword unfolds, we bring together all the artists and craftsmen whose skills turn it into both a modern work of art and a window into the past. 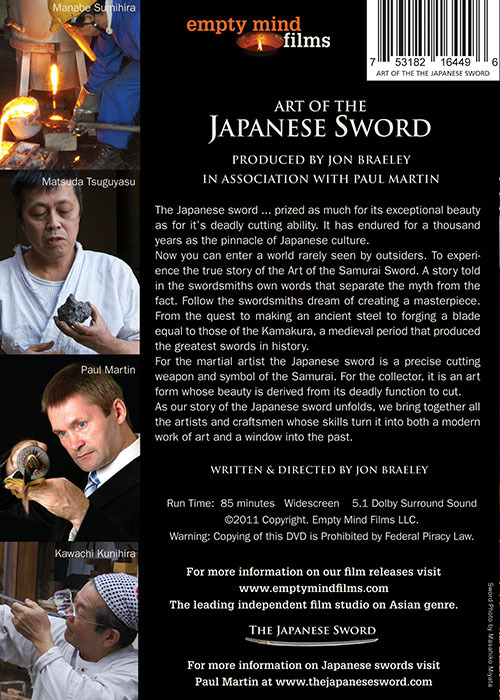 Produced in association with Paul Martin, a leading Japanese sword expert and filmed across Japan with the very best swordsmiths and craftsmen, each one a master of their art. Step into the Shinto shrine and museums to look back at the history of the Japanese sword which also parallels the history of the Samurai. 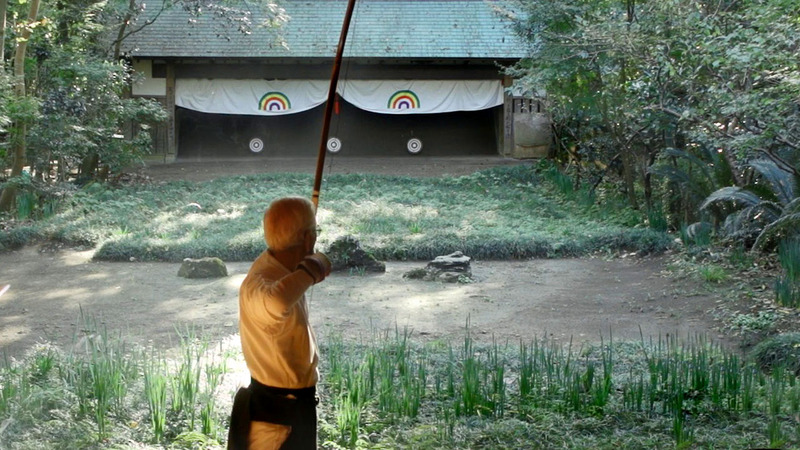 If that’s not enough for Samurai enthusiasts we enter the Tenshin Shoden Katori Shinto Ryu – the oldest martial arts dojo in Japan, where traditional sword fighting techniques of the Samurai are still taught. 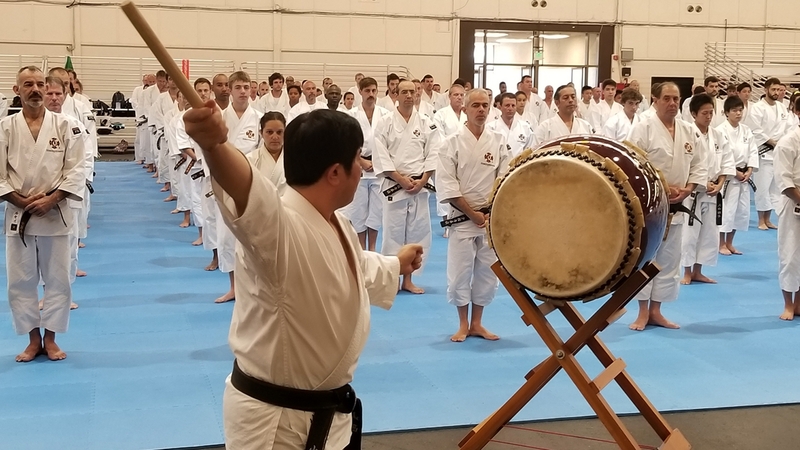 The schools instructor and top martial arts master is Otake Risuke sensei who grants a very rare interview to talk about this most ancient symbol of Japanese culture. Art of the Japanese Sword is a truly unique exploration of one of the worlds most beautiful yet deadly weapons. Featuring the following swordsmiths: Kawachi Kunihira, Matsuda Tsuguyasu and Manabe Sumihira and more. One Japan’s top sellers of Japanese swords includes the DVD Art of the Japanese Sword with each sale … a testament to the quality and accuracy of this unique documentary. 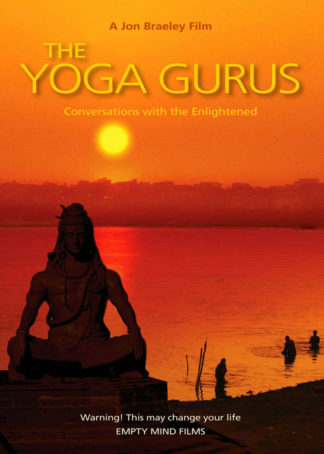 Read a review here by Kendo World Magazine. Many artists work are highlighted and an appreciation of the complexity of this spirit of perfection can be appreciated more. Would watch more on the same topic if executed with the fastidiousness of this feature. 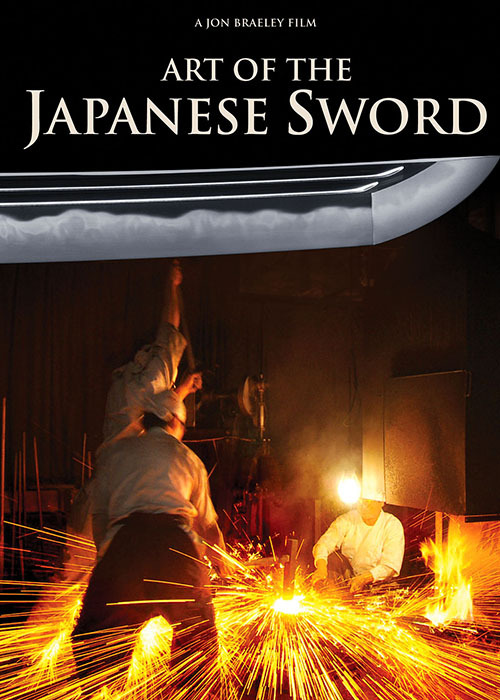 This DVD does an outstanding job of covering the basis processes involved in making a Japanese sword in one hour and 23 minutes. Does the video cover every single aspect- no. I do not believe one video or book could. I’ve studying the art of Japanese sword making for several years, read many good books and spent time with a traditional Japanese sword smith in his shop. The making of a Japanese sword is not a simple process, but take the collaboration of many master artisans. One thing I liked particularly about this video was the interviews with each of the artists as they worked. It takes years of hard work before any apprentice is permitted to work on their own. I didn’t realize that saya or scabbard maker requires an 11 year apprenticeship. I recommend anyone seriously interested in wanting to understand what goes into making a Japanese sword to watch this video. One item which didn’t get much attention was the tsuba, but that is almost an art form in and of itself as is every process involved in making a traditional Japanese sword. The only thing I can think of that is better than watching this DVD would be to spending time with a traditional Japanese sword smith as they first make their steel and then transform into a work of art. 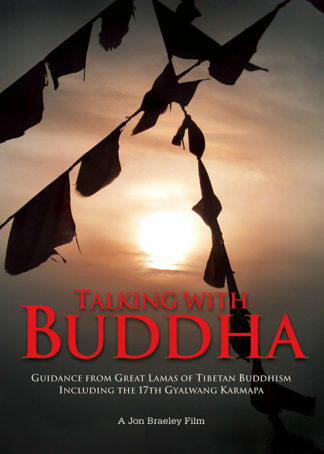 That is something I had the opportunity to do and I encourage others to do, but one can save a lot of time and money by simply watching this DVD as it contains things which I had not previously seen before in other videos or books. Both informative and completely memorizing and quite frankly blew the doors off of the documentary I have seen produced by National Geographic. I found the commentary from the artisans and guildsmen very detailed and informational that was explained in layman’s terms that every artist can relate to. 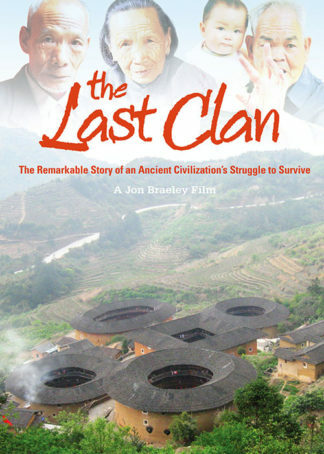 For anyone that appreciates culture, history and tradition as well as a glimpse into an otherwise previously veiled world this is a must see! This is a comprehensive look into the multifaceted process of creating a fully fitted, finished Nihonto or Japanese sword. The quality of the video is very crisp and clear, and most of the major questions are asked/answered. A great film for both the casually interested and ardent students of all things related to Japanese swords. 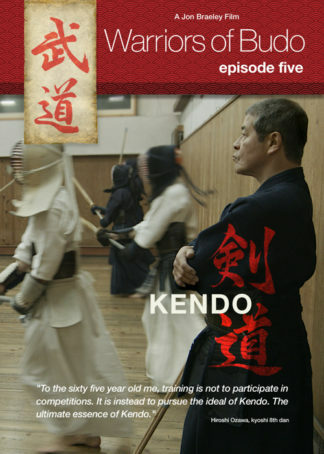 If you like to study samurai swords, or if you are a practitioner of martial arts, you will love this DVD! It was done using many of the current smiths and artisans currently working in Japan and the quality of the film, the content, the interviews, and the video of them performing their craft, is truly amazing! One of the best I have seen on this subject and a must have for any nihonto library! Amazing view into the arts of the sword smith, and his life. This movie, is not just about the making of Japanese swords, it’s about how the man (smith) breaths a life and soul into a non living object. 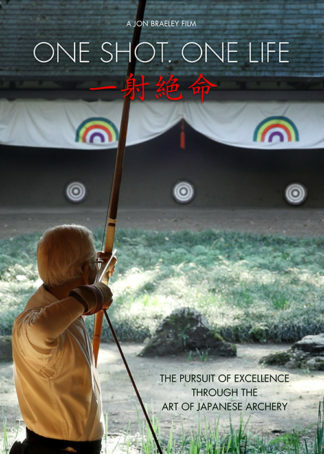 I would encourage all people interested in the classical arts of Japan to watch this movie. Please submit your review here, thank you.